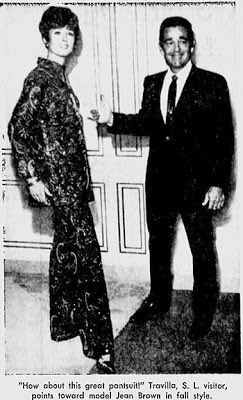 Since actresses first appeared on screen and women began emulating their appearances through hairstyle, make-up or clothing, film executives realized one way to get women into the theaters is by presenting stars in the most glamorous of outfits. And if the styles, or something very similar can be purchased, everybody wins! 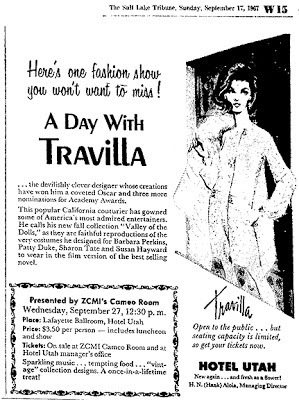 With his twenty-five plus years in both film and fashion, Travilla already knew the importance movies played in advertising his private clothing line and had incorporated pieces in his collections based on films he was working on beginning with 1958's "Beyond the Terrace" starring Joanne Woodward, the 1960s with "Valley of the Dolls," "Daddy's Gone a Hunting," "The Big Cube," and continuing until "Dallas/Knot's Landing" in the 1980s. 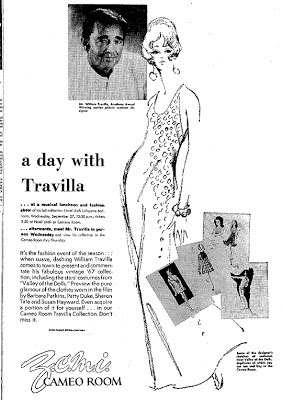 From among several newspaper articles, I've managed to piece together an idea of the sixty pieces inspired by the "Valley of the Dolls" for Travilla's 1968 Spring/Summer line 1968. 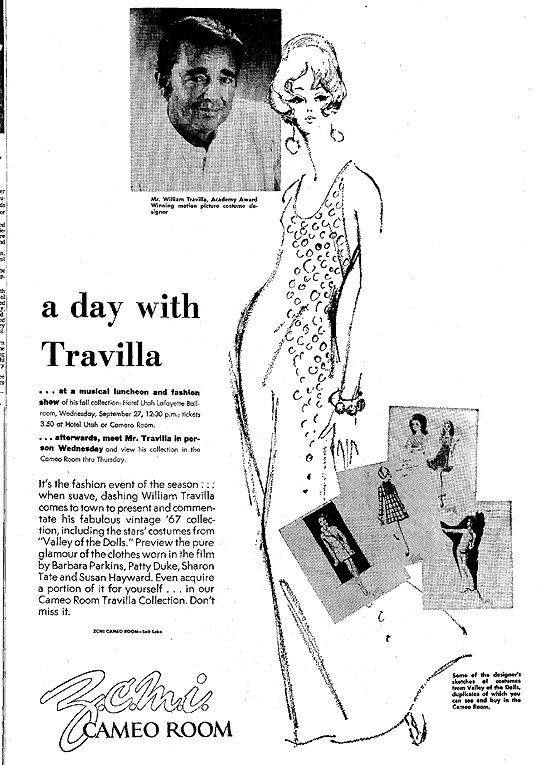 September 24, 1967 Newspaper ad featuring some of his "Dolls" sketches. September 17, 1967 Newspaper ad featuring one of his "Dolls" sketches. 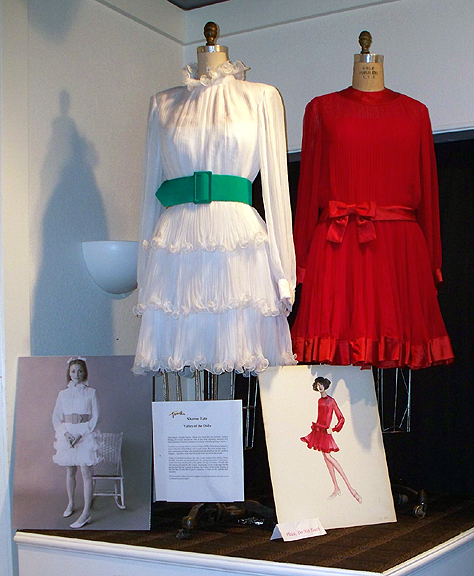 Among the collection were a white jeweled trench coat, a bias-cut gown in white crepe pleats with halter neckline, sheer feminine shirtwaist dresses with puffed sleeves of white sheer wool, cowboy-inspired with seaming marking a lowered waistline and of white point d'espirit with straw daisies appliqued on the dirndl skirt. John Barrymore collars deeply slashed with long lapels and ruffled touches; short flirty skirts; woman-tailored costumes; wool pajamas cut on the bias; a trend called "fit and flare" based on the natural waistline,with fluid and flowing seaming; belts and ascots in canary yellow and green for daytime and pants dress cut to defy detection, and long sleeveless gown in three tiers of pleated white chiffon with fluted ruff at the neck. 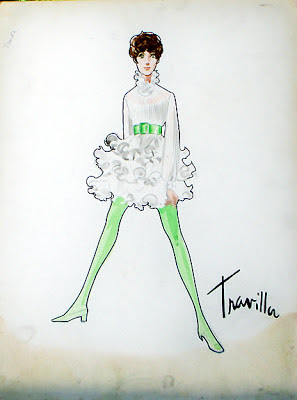 Travilla used lots of green in all shades from pale to brilliant, plenty of white and more than a smattering of black, which Travilla claimed "is definitely on its way in." Pink version of white evening gown described above. "It's time for women to look like women before the fellas get their first!" "If I ever had to go down the street with one of those monstrosities pictured in Vogue or Harpers, I'd resign." "Forget about the crazy watches, the mod stockings, the way out hairdos and concentrate on an important dress or costume and the right, very simple accessories." "I think it's ridiculous when 40-year-old women say they can't wear short lengths. After all, the leg is the last to go. It holds up, you know. I much prefer a knee or leg showing than arm." Posing with model Jean Brown in the retail version of Helen Lawson's sequined and jeweled pantsuit. 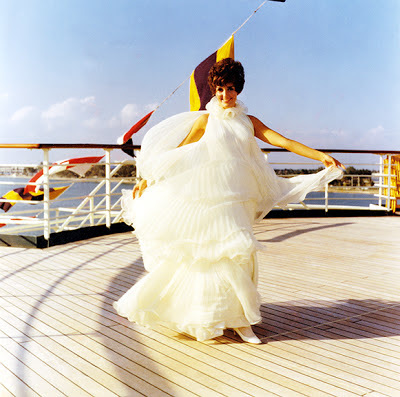 Travilla took the opportunity to bring many of the collection's pieces along on the "Valley of the Dolls" film premiere cruise aboard the Princess Italia from it's Miami-Acapulco-Los Angeles leg of it's trip originating from Europe. Included in the extras on the "Valley of the Dolls" 2-DVD set is the original one-hour television broadcast special which features a few minutes of Travilla. Gown in white on board the Princess Italia. Same model in different outfit. White and green color combination as mentioned above. Sharon Tate modeled several of the outfits and photographs of the actress appeared in the fashion sections of countless newspaper, garnering publicity for both the film and Travilla's label. The captions below were taken from those. Thin-line navy and red on white wool plaid. 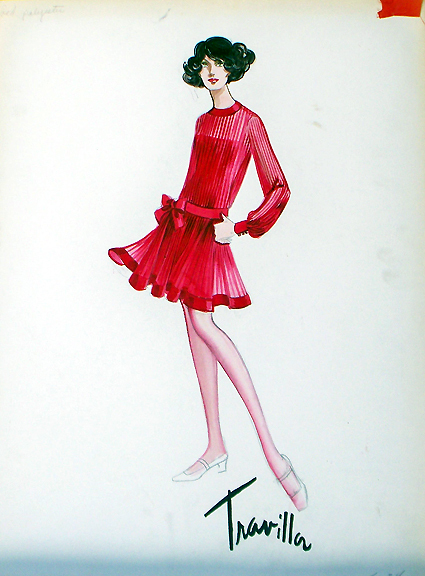 Wrapped standing collar and mobile bias skirt with side flair. 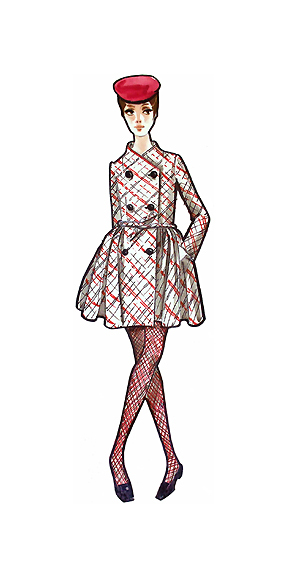 Orange and white wool double -breasted coat-dress ensemble cinched in leather. White wool double-breasted coat dress with burst of hemline pleats. 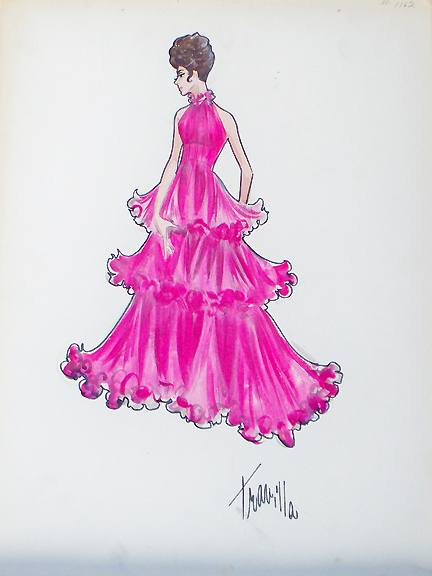 Pleated panel shell-pink chiffon with criss-cross neckline.